"Big Adenium" grafting with Rosy Adenium. These are our Rosy Adenium grafting on Giant Size Thai Roostock. 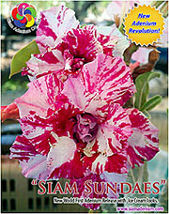 We can provide this to you with your own flower selection on these rootstocks. click here for more information.